USCF Sales won't be beat on price! We'll match the product prices of Internet-based Chess Specialty Shops in the United States. 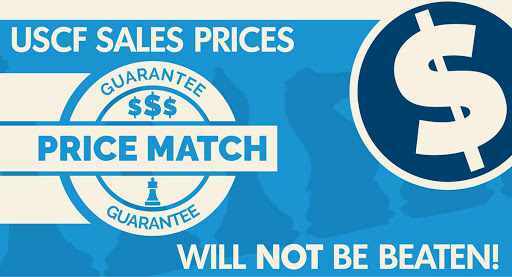 At the time of sale, we will price match all Internet-based Chess Specialty Shops in the United States. We are sorry, but price matching cannot be requested after the order has shipped. Our Price Match Guarantee covers one price match per identical item, per customer, at the current pre-tax price available to all customers. Our ability to allow the purchase of higher quantities of items via price match is subject to item availability, which is determined at our sole discretion. Our Price Match Guarantee also includes discounted/free shipping offers, when performed in conjunction with item price match. The prices of retailers that do not focus solely in the sale of chess-related products. This include such general retailers as Amazon.com, eBay.com and Barnes & Noble. Competitors' special daily/hourly sales or discounts that are not currently active (either expired or future). Any bundle offers, free items, pricing errors, mail-in offers, items that are advertised as limited quantity, out of stock items, clearance items, open-box items, refurbished items, pre-owned items, gift card offers, and items for sale Thanksgiving Day through the Monday after Thanksgiving. When making a purchase, price match requests from are handled via phone. Please call 1-888-51CHESS (512-4377). Please tell us about the lower price that is still in effect that you want USCF Sales to price match. We will then review and verify the price match request. If we cannot verify the quoted price is accurate, we will not be able to honor the price request. Can I request a price match after I've placed my order? As long as your order has not shipped yet, we would be happy to retroactively price match. Please contact us immediately at 1-888-51CHESS (512-4377). To help expedite the process, please have the website address of the company you wish us to price match available when contacting us. If you are emailing us, please including the web address in your email. Sometimes a qualifying competitor will advertise a product in ads and on its website as having limited quantities in stock. If the item is out of stock or the competitor has advertised as limited quantities of an item, it is not eligible for price matching. Likewise, if USCF Sales has a product that is advertised as being limited in quantity it will not be eligible for price matching. Does USCF Sales price match "free gift with purchase" offers? No. we do not price match "free gift with purchase" orders. This includes free gift card with purchase offers.